It started in September 2009 when my brother got a bike through his employer on the Cycle to Work scheme. He told me how you can get a discounted bike from your employer if you ride in to work. I investigated a bit further and thought I could do this. I haven't really ridden a bike since I passed my driving test at 17 (I'm now 31). I thought I would investigate if my employer would take part in the scheme so I could get a bike. At the same time a couple of other colleagues were also interested and over the next couple of months we pestered our employer to join the scheme. Many colleagues thought it was hilarious that I wanted to ride into work and many even said they'd pay to see me do it! Well, February 2010 arrives and we find out that the company has signed up to the Cycle to Work scheme. More jibes about my ability to cycle to work come my way but I just start looking at what bike I can get through the scheme. I start looking at mountain and hybrid bikes and completely discount road bikes due to my size and the fact that it will restrict me around the local country parks and trails. I decide to set myself a limit of £350 for a bike and my line manager showed me a review of £300 hardtails in What Mountain Bike magazine. The winner was the Specialized Hardrock. 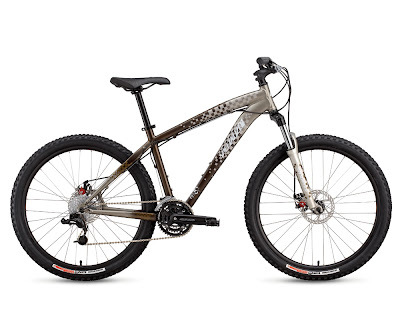 I liked the bike a lot and proceeded to look at the other bikes in the Hardrock range. I quickly decided that the Hardrock Disc would be a better bet and was within my budget. However, I started to worry that the bike might not take my weight so I started looking at the FAQs on the Specialized website. A few people had asked similar questions and the response they got were that the frames were more than strong enough but the wheels were not. I was also worried that the 80mm suspension travel on the forks were not enough to handle my weight. After further investigation I found a different bike from Specialized. The P1 All Mountain. The bike is very similar to the Hardrock but with stronger wheels and bottom bracket, stiffer and thicker frame and 100mm fork travel. I decided this was the bike for me. I ordered the bike on 1st March (the start of the scheme) and it was delivered a week later. The reality of having to use the bike for my commute to work sinks in. I now have a catalyst for losing weight and getting fit. On 8th March I also started a sensible diet, as cycling alone won't help me lose all the weight I need to. It was £359.99 discounted from £399.99.